Organ Delivered and Installation begun. Our new organ has arrived! A special thanks to Erik, Dillon, Matt, Rob, Adam, and Michael for hauling the 600 pound instrument up the front steps and into the sanctuary. Over the next few weeks installation of all the components will be completed. As part of the Building Faith campaign, funds have been raised for a new electronic digital organ to lead the worship at Faith. After extensive research of various organ models, we have ordered and paid the down payment on the Ecclesia T-370 (see right), a three-manual digital organ manufactured by Johannus Organs in the Netherlands. The instrument is expected to be delivered this November. Installation and voicing will take a few weeks, and the organ should be ready for use in the Advent season. The formal dedication of the organ will take place in the first half of 2014. Given the extensive and costly repairs needed for our existing pipe organ and the ongoing expense for mere maintenance and tuning, the digital organ was determined to be the more cost-effective choice. 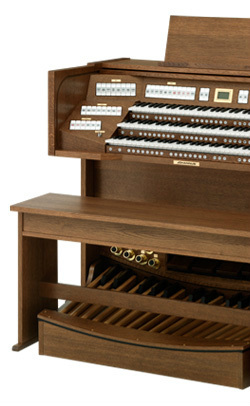 Digital technology reproduces authentic and high quality ‘pipe organ’ sound at a much lower cost.